Here it is then , Ian as you have never seen him before !! 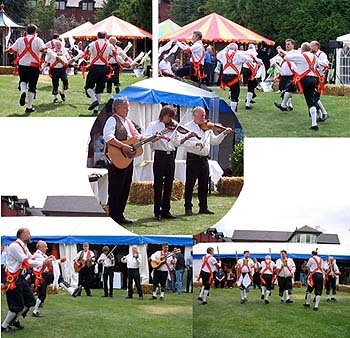 We have prepared a collage of Ian playing at the Belfry 2004 for Albion Morris and yes that really is Simon Nicol of Fairport ! 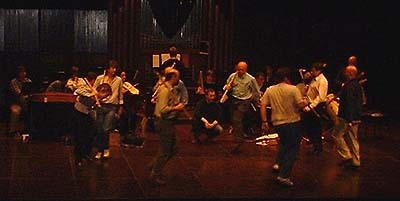 Ian danced the "Crusader Dance" at the Queen Elisabeth Hall on 22nd January 2003, here is the proof !! His partners in crime in this venture are Paul Draper, Richard Busby, Steve Watts, Guido Rincon, Peter Stowe, Adrian Turnham, Stewart Hollyer and our caped crusader himself ! All these pictures were taken at Dranouter Festival in August 2001. If any of you have any pictures of Albion let us know and we will put them on this page for you. 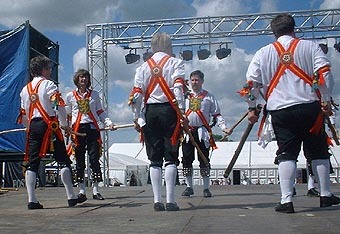 Here he is in full Morris kit playing the lovely Bridge fiddle. The full band from left to right Don Fortune,Ian , John Watcham and John Davey. Here are the boys strutting their stuff.The line up is from left to right : Paul Draper , Steve Watts , Martin Long , Peter Stowe. 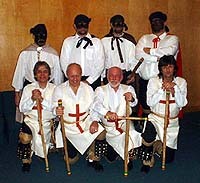 Adrian Turnham , Robert Daultrey , Richard Busby and Guido Rincon. Robert Daultrey (Dots) doing a solo clog dance and being viciously judged by his peers. 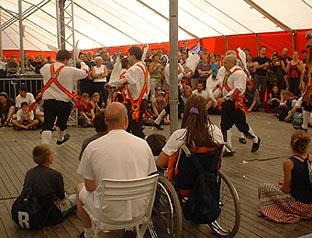 Albion not only do exhibition pieces but workshops as well, here they are teaching some dances. 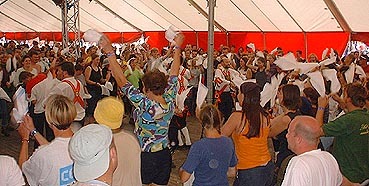 The hanky waving being an essential for a Morris Man , here are the Belgians doing it frantically !!! The above and the next two photgraphs are the ones Ian dearly didn't want me to publish. Well thats all for the Albion page , don't forget if anyone has some interesting piccies of Albion let me know and we will publish them for you . Keep it up Albion ! !